A great post by Unlearning Economics on the site Pieria argues that ‘free trade’ is a myth. Both proponents and opponents miss the point that markets are built rather than natural, and that they depend on politics, not some sort of standalone economic process. As is common in economics, I can’t help but feel this debate is being conducted on a phoney dichotomy: between the state and the market; managed or non-managed trade; politics or economics. All too often there is the idea of an implicit ‘free trade’ baseline, and one side argues for it while the other suggests strategic interventions to steer trade in the right direction. As I pointed out in a post a couple of years ago, some of the Wikileaks revelations showed that trade is political, and has nothing do with comparative advantage. My work on trade policy in developing countries strongly confirms this view. For instance in the tiny, isolated island nations of the Pacific, trade is built on ancient colonial relationships, modified in recent years by the influence of more powerful political interests such as those of big neighbours Australia and New Zealand. The Pacific island nations mostly specialise in a few agricultural commodities, fish and coconuts, as well as tourism. To an extent you can argue that these are the countries’ comparative advantages — what they’re domestically better at producing relative to production of other things. But that statement doesn’t really mean much. Britain and France, which used to own most of the Pacific before independence in the 1960s-70s, used it as a resource base for export to their own countries. That’s partly why these countries have lingering, entrenched agricultural sectors with limited value-addition. It certainly isn’t in their development interests to continue specialising in copra, which is one of the lowest-value products, or to keep exporting fish from their seas without processing it onshore. Pacific island nations are mostly too small and inflexible to industrialise, and they lack the human resources or land area to be able to quickly move into conventional, more value-adding sectors. Nowadays the European Union is washing its hands of its former colonies around the world by obliging them to take part in a series of trade deals known euphemistically as Economic Partnership Agreements, which redefine their trading relationships as being reciprocal, meaning that any concession the EU makes, like a preferential low tariff rate, must now be given back to the EU in return. Brussels is no longer prepared to defend a special waiver for African Caribbean and Pacific countries at the World Trade Organisation which allowed the EU to violate the Most Favoured Nation rule, which is supposed to accord one country or region treatment no less favourable than another. For similar reasons Australia and New Zealand are also prodding the islands in the direction of new trade deals — the Pacific Agreement on Closer Economic Relations (PACER) and PACER Plus. It’s nothing to do with direct commercial interest, just the new realities of the global economy and the need to set a precedent for other, more lucrative trade deals, such as those with Asian countries. There’s an element of ideology at work too. ANZ trade officials think that all countries should do ‘free trade’ because it works for them. They forget that their own countries developed under strong protectionism. Neither of these deals make much development sense. The Pacific islands have already long had duty and quota-free access to Europe and ANZ. Why shouldn’t they be allowed to keep it? And it’s up to the islands to decide what tariff they impose on the goods of foreign countries. In fact if trade agreements were really anything to do with the simple ideal of ‘free trade’ or direct economic interest, the Pacific islands wouldn’t be engaging in time-consuming, technical and troublesome deals with the EU, Australia or New Zealand at all, since the islands are increasingly trading with Asia. 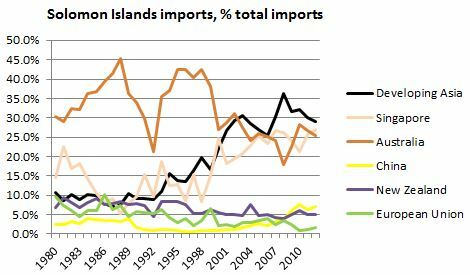 The following graphs show the historical direction of exports and imports in the Solomon islands since 1980. China has become by far the biggest export partner, although its share is now dwindling. Exports to the EU have steadily dwindled since the 1980s. On the import side, developing Asia is the big story, and Singaporean imports have similarly risen strongly, while Australia is currently the second-biggest import partner by country, although with a volatile history. Measured by both exports and imports, the EU is the country’s smallest trading partner. 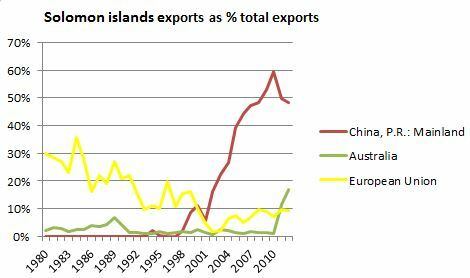 So why aren’t the Pacific islands striking deals with Asia? If trade policy were about some sort of neutral pursuit of economic interest, the islands wouldn’t be wasting their time with the EU and ANZ; they’d be looking north and nearer east, and they’d be thinking about new opportunities in technology and services. But as it happens the current big powers with lots of political clout have decided that they want to do trade deals with the islands, and what they say, goes. China and Asia have very little trade interest in a region as tiny as the Pacific — its collective GDP is about the size of a mid-sized European town. If I had a slight criticism of the Unlearningeconomics article, i’d say that she or he neglects the vast lobbying power of corporations and the extent to which trade deals are a product of the shoutiest multinationals. It’s a mistake to think of countries as necessarily acting in the interests of their citizens. The Wikileaks cables show that the United States acted quite clearly in the interests of McDonalds in El Salvador, partly due to powerful lobbying. The US also intervened behind the scenes in the interests of Monsanto and genetically-modified foods in Europe over many years. This had nothing to do with the comparative advantage of the United States or what was good for Americans. The reality of trade is that it is always, necessarily, regulated. There is no ‘free’ baseline, untouched by politics, history and culture, to which we can aspire. Trade is always managed, implicitly or explicitly. We can pretend that this isn’t the case and pursue an ill-defined ‘free trade’ ideal, allowing powerful interests and luck to shape the nature of the global economy, perhaps to the detriment of many. Alternatively, we can bring the management of trade into the open, making trade decisions political choices subject to public and professional scrutiny, respecting each country’s unique needs, and making sure that countries cooperate instead of descending into economic – or worse, real – conflicts. Very much agree with the general sentiment of this post – the EPA and PACER-Plus have far more to do with the trade strategies of the EU and Australia and New Zealand than they do the promotion of economic growth in Pacific states. A couple of things are not quite right here though. That the Pacific’s ‘collective GDP is about the size of a mid-sized European town’ is misleading (perhaps only meant as an exaggeration?). There are more than 8 million people scattered across the region (more if you include the non independent territories like West Papua, New Caledonia, Guam etc). The collective economy of the Pacific is larger and more diversified than implied here. Yes tuna and copra exports are significant, and more could be done to develop ‘value-added’ processing for these products in Pacific states, but the island economies are considerably more than fish, coconuts and tourism. An area I am particularly interested in is the diversification of agricultural exports. As you suggest, reflecting colonial-era production, more than 60% of agricultural exports from the region are still destined for Europe. Key commodities include coffee, copra, palm oil, sugar, cocoa, and vanilla. However there is also a diversification into a range of higher-value tropical crops. In Fiji for example, farmers have focussed on sugar exports to Britain for more than a century under exactly the model you outline – as a source of raw material for value adding in Europe. However over recent years farmers have shifted into other markets, and today in Fiji 200 different agricultural products are shipped to 20 different export markets. That story is one other island states might learn from! I have my doubts about whether Australia has any interest in market access on aggregate given that the GDP of the 14 non-ANZ Forum Island Countries is US$20 billion, which is about 1.3% of Australian GDP and 14% of NZ GDP. As a point of comparison, London’s economy is 36 times bigger than the whole FIC Pacific. Fiji and PNG obviously make up the lion’s share of the regional economy. Of course individual lobbying interests may have disproportionate influence — eg. a hardware company that wants access to the region — but it’s difficult to know this. I think the real motivations behind PACER Plus and so on are ideological and precedent-related. New Caledonia and French Polynesia might be more enticing commercial prospects. New Cal’s per capita GDP is higher than New Zealand’s, and it’s quite possible that very forward-looking types in Canberra and Wellington have an eye on these markets — but currently there’s little prospect of ANZ doing a deal with them. I acknowledge the prospect of the Pacific exporting niche agricultural products but they will remain exactly that — niche. They’re certainly a part of the diversification that needs to take place, at least in Melanesia, and no doubt more could be done to supply the domestic market given the natural rate of protection that exists, but I think the export future lies predominantly in services, and certainly the services sector, principally tourism, has supplied the vast majority of export growth in the last decade. Technology has a huge future role to play given that it tends to address the two major constraints of small island states — distance and smallness. Yes, I agree that pursuit of PACER-Plus is probably more ‘precedent related’ than a pursuit of market access. Same goes for the EPA negotiations with the EU (at least with regard to the Pacific, the EU probably does have significant commercial interests in pursuing market access in Africa). I meant that the agreements are designed in keeping with the respective trade strategies of Brussels and Canberra. Ie. in Canberra DFAT decided to pursue bilateral and regional FTAs in the Asia-Pacific region and has done so quite successfully over the past decade. There is little indication that negotiators at the EU or in Canberra have been prepared to deviate in any substantive fashion from their ‘standard FTA’ template for the sake of negotiating with the Pacific island states. I don’t think services vs niche agriculture are an ‘either/or’ scenario. Clearly Pacific countries can pursue both. Indeed the cost structures of the island states mean they generally can’t compete on volume or price for manufactures or traditional commodity exports, so both services and diversified niche agriculture are important. I would argue that agricultural exports are especially significant, based on the view that agriculture is most likely to offer a broader base for employment and offer opportunities that complement existing livelihoods and land ownership. Take Vanuatu. A substantial majority of the population live on communal land in rural areas, rely on subsistence agriculture, cook on wood fired stoves and have no electricity. The formal sector for the country is very small, as is the skilled workforce. Education standards could be improved significantly and internet access is costly, slow and unreliable. It’s hard to see how Vanuatu’s competitive advantage is in international services reliant on telecommunications technology. Of course Vanuatu clearly does have service sectors of significance – tourism and offshore financial services – but will these sectors provide sustainable livelihoods for a growing population? Note that even old school cash crops, while not new or flashy, remain important right across the Pacific. In the highlands of PNG for example hundreds of thousands of people are reliant on coffee (for export) for their cash needs (some estimate half of all rural households in PNG rely on coffee for cash income). Improving the value of these exports is so important. On trade agreements, yes, you can definitely see that Canberra has a policy of doing deals with its neighbours, and the Pacific is one of the only areas where it hasn’t yet struck an agreement. Australia clearly has far bigger commercial interests in Asia, though. Should policymakers promote agriculture or industry? Lewis’s dual economy model dates to the 1950s and the same debate has been played out in a number of other contexts. As you say, the answer is both. I think it’s important to acknowledge that the two sectors have different roles to play — and in agriculture it’s also important to distinguish between domestic subsistence production, domestic cash production and export. The first, as we know, provides sustenance for a majority of Melanesians, at least in PNG, Solomons and Vanuatu. It’s obviously not anything to do with export as it’s not cash production, but it does play a food security and import-substitution role and for that reason it’s effectively part of trade policy and should be supported. Domestic cash agricultural production is also critical for similar reasons. Linkages policy is probably more important than has generally been realised, especially with the growth of tourism. And even if it’s tiny on aggregate for a country, cash agricultural production like copra can be a hugely important source of income for small, isolated communities. Production for export is a different ballgame and has sometimes been less than successful given challenges such as the incentives of workers — ie. rural people don’t have to work for cash because they have access to subsistence gardens; the fragmentation of countries; smallness; poor infrastructure; distance from markets and quarantine and SPS issues. I suspect that for these reasons the export of agricultural produce will always prove challenging, with some notable exceptions, particularly in PNG. Industry and services, on the other hand, play a different role, one of providing cash incomes to predominantly urban workers and the middle class. Increasing urban drift means that it is essential that some form of industrial or services-sector employment is created. And like it or not, most ‘successful’ (a difficult word) developing economies underwent transition from subsistence to cash production. Vanuatu’s cash economy is overwhelmingly services-orientated, and it’s not just tourism and financial services. Labour mobility is estimated to provide something like 20% of the value of earnings from tourism, which is itself the mainstay of the cash economy. I feel that in the Pacific too much trade and industrial policy has been backward-looking, unintelligently designed and lobby-based, revolving around subsidies and protection of vocal interests. There’s no way many of the smaller Pacific island states are going to develop old-style manufacturing, particularly against a backdrop of tariff preference erosion. Governments should try to promote new industries which have genuine potential in the very specific circumstances of the Pacific. Services are certainly a part of this. Luckily for the islands ICT is a key part of the future of global industry. Today’s 4G infrastructure and 3D-manufacturing are yesterday’s railways and production lines. With my optimist’s hat on I think that internet-based and new technologies like additive manufacturing have a role to play — and could even allow some of the Pacific island states to catch up or even leapfrog other industrialising countries. You’re right that education needs to improve. Infrastructure is already getting better, with the arrival of the fibre-optic cable in Vila next year and planned extension to elsewhere in the region. It’s also encouraging to see some governments put in place decent ICT policies. The link between trade and ICT needs to be strengthened, and policy needs to be proactive and strategic, rather than laissez-faire.